Common fleabane is a biennial/short lived perennial that blooms from April through July in my Middle Tennessee garden. It is native throughout much of the US and Canada and is often seen growing in open fields, grassy ares/lawns and the edges of woodlands. While it prefers a moist soil it will adapt to almost any soil type and sets seeds with abandon; thus this Asteraceae family member is often seen as a weed instead of the ecologically valuable pollinator plant that it is. A crab spider hiding in plain sight is ample evidence that pollinators and other insects visit Fleabane. You can let Fleabane naturalize in your lawn or plant it in your garden. Not one to be afraid of colonizing plants, I let this rough and tumble wildflower seed in the lawnette along with Lyreleaf sage, Danthonia spicata and Entireleaf Western Daisy. Go ahead, give it a try, you'll make the bees and other pollinators happy and you can always deadhead it before it sets seeds. Bonus~you'll get more blooms! Yep, this little beauty pops up in my garden too. 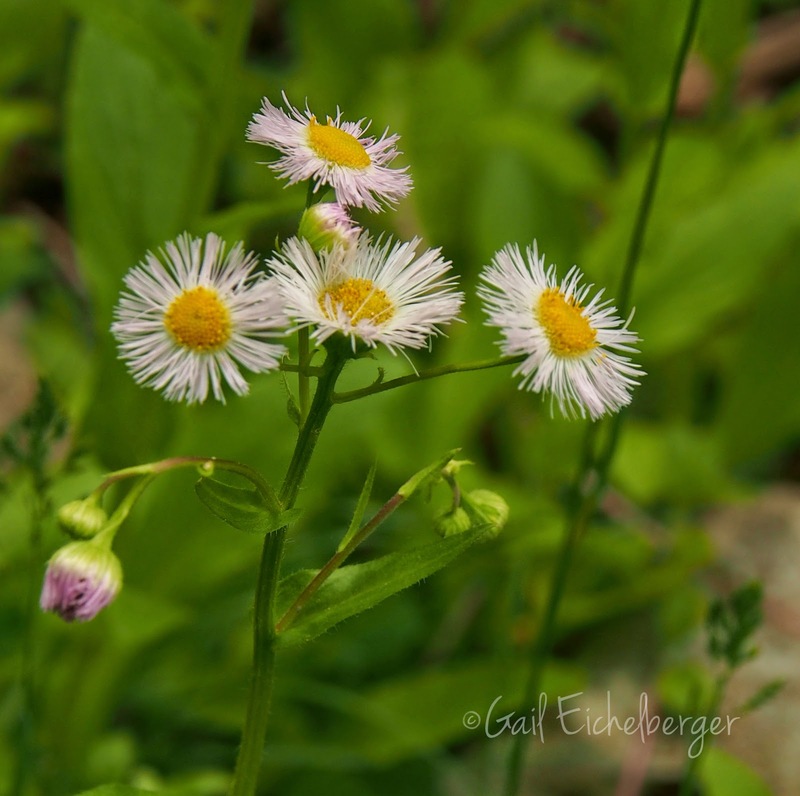 I have grown fleabane, and think I still have some, but I'm not sure. There are some plants that are up that I"m not remembering the names of, so hopefully, there are still some out there. I also have boltonia, and sometimes get the two mixed up. have we seen your lawnette? then lightly strimming around any wildflowers that volunteer. Yes, I've shown it before, but I am planning on doing a post on it soon. I love Buffalo grass and wish it would grow here. Tried a buffalo grass patch, but just ripped it out. YMMV, but I didn't care for it. I wanted a patch of dense grass that only needed mowing 1-2 times per year. It gave me that, but it was dormant for about half the year, which wasn't so bad on its own, except that it allowed weeds to invade and those weeds were nearly impossible to pull, without ripping up a patch of buffalo grass. I suppose I could have learned to stop worrying and love the weeds, but it just wasn't my cup of tea. Plus the buffalo grass will try to colonize neighboring areas by rhizomes. As for the Erigeron, I've never seen it try to volunteer in my yard, but I'll keep an eye out for it. I do grow another Erigeron (E. pulchellus - http://www.wildflower.org/plants/result.php?id_plant=ERPU) that I bought at a nursery. I'm quite happy with it so far! It seems to have settled in nicely in a partial shade spot, the foliage is fuzzy and evergreen, and it has a nice floral display this spring. I didn't notice all that many pollinators on it, but it's still a small patch. Perhaps there will be more pollinators if/when it spreads a bit more, although it's in a pretty crowded bed hemmed in by geraniums, a camellia, an oakleaf hydrangea and so forth. I have found that 1 gal. 20% vinegar + 1/4 C. salt + a few squirts dishwasher liquid (for adherence to leaf surfaces) in a sprayer actually beats Roundup for initial results and longevity. Good to know Sandy with recent research pointing out the harmful/carcinogenic effects of Roundup. But won't adding salt to the soil make it hard for anything to grow there in the future (other than salt-tolerant plants of course)? Daisy Fleabane grows well here. I don't cultivate it, but it just grows! Very sweet. Hugs, Missy!! This beauty found its way into my garden and meadow and its a keeper! This fleabane would be perfect in my small front lawn! That lawn has about ten different things growing in it, which I encourage, including wild violets, clover and mosses. I will have to search this out. Thanks, Gail!